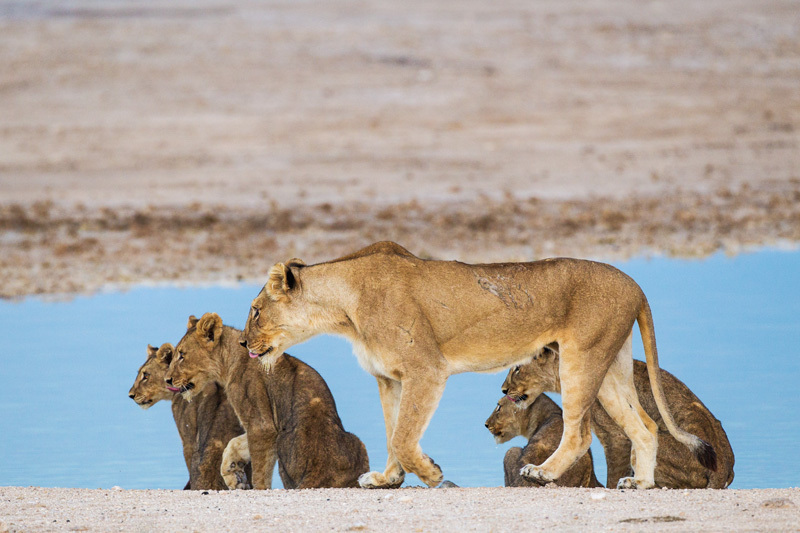 The mother and her cubs look toward another member of the pride who began to call out. Remember the lion pride that featured in the first hunt that I witnessed? 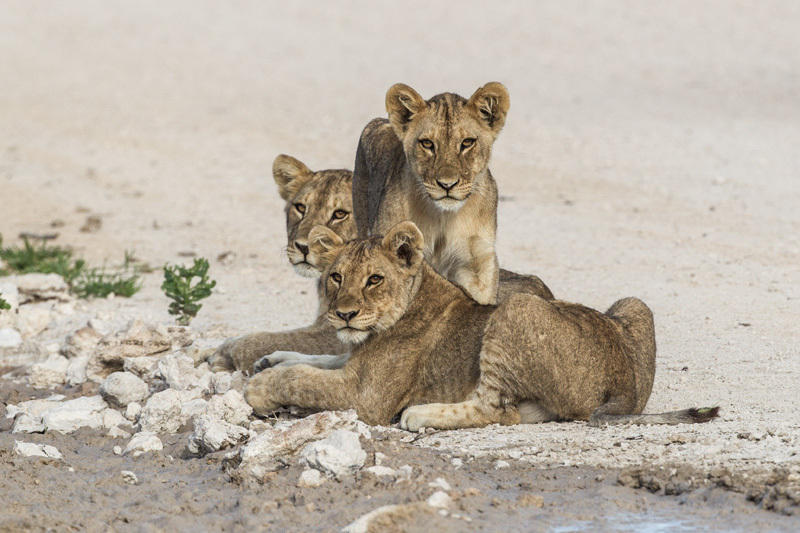 This pride is perhaps seen most often by those who visit Okaukuejo, as their base is just a 10 minute drive from the camp along a Etosha’s most busy highway. I see this pride multiple times on each visit as my usual drives takes me through much of their pride lands. During my previous visits, I had seen the adult members of the pride, but never any young ones. Although, there was one instance last year when a female – who clearly had very young cubs – I saw at the Nebrowni waterhole drank quickly, rolled around in elephant dung and walked away briskly into the bushes. Whether the rolling was to mask her scent or using it as a natural bug deterrent I am not smart enough to say. Whatever it was, the fact that she successfully protected her young cubs is there for us to see now! 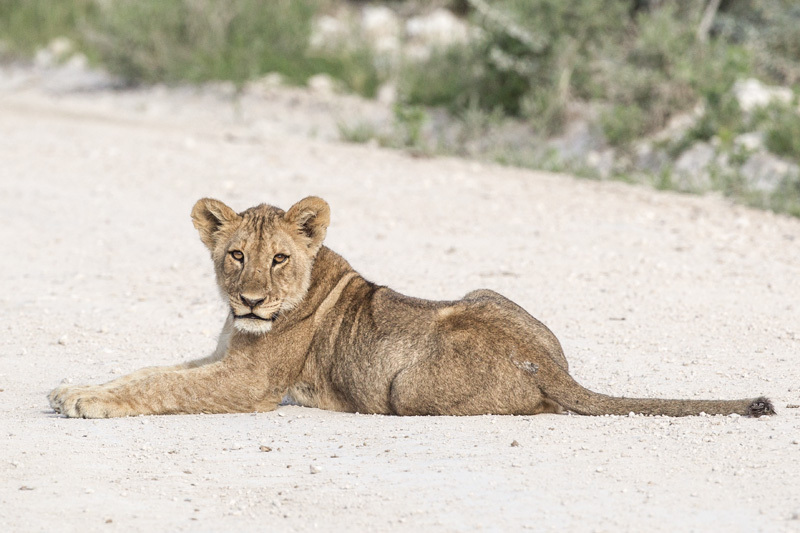 I was very happy to see the not-so-young cubs joining their mother into the open and sitting by the roadsides with the rest of the pride. If their mother is anything like human mothers, then there is no doubt that she is one proud parent because her babies are incredibly beautiful (but, isn’t that the case with all living things? :-). I’ve now spent many hours with the pride this season. While adult lions are among the most boring animals to watch as all they ever do is laze around (Well, they do yawn sometimes, but that’s about all the action that is often seen). However, there is never a dull moment when there are cubs in the mix. Play-stalking, biting, jumping, running, slapping and irritating the big male is all fair game for the cubs. It is so much fun to watch them fool around that you often lose track of time. I’ve now come across these cubs five times, and each time they have been incredibly playful. And it’s such a joy to be with them. How I wish I could be as carefree and happy as a child! Ah, the childhood, we all miss it sometimes. Maybe the lions do too? 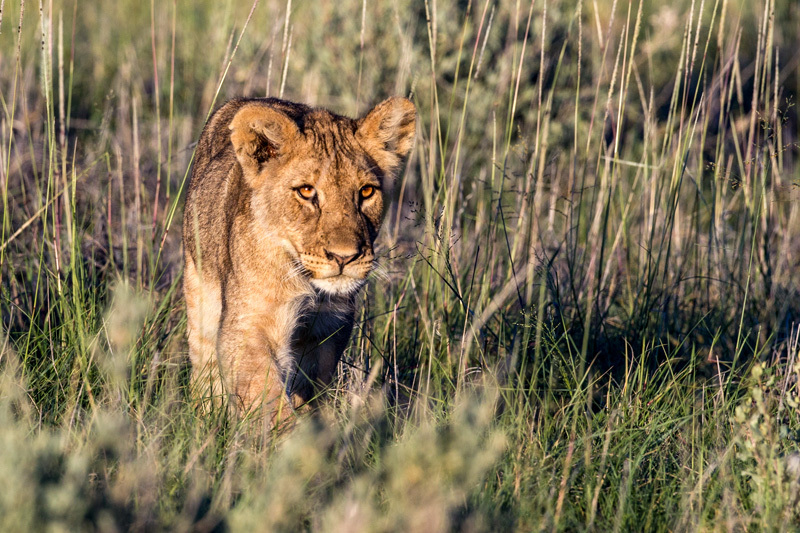 A cub playing the stalking game in the tall grass. Relaxing, and perhaps plotting their next game? A cub greets its mother as she comes out of the tall grass. 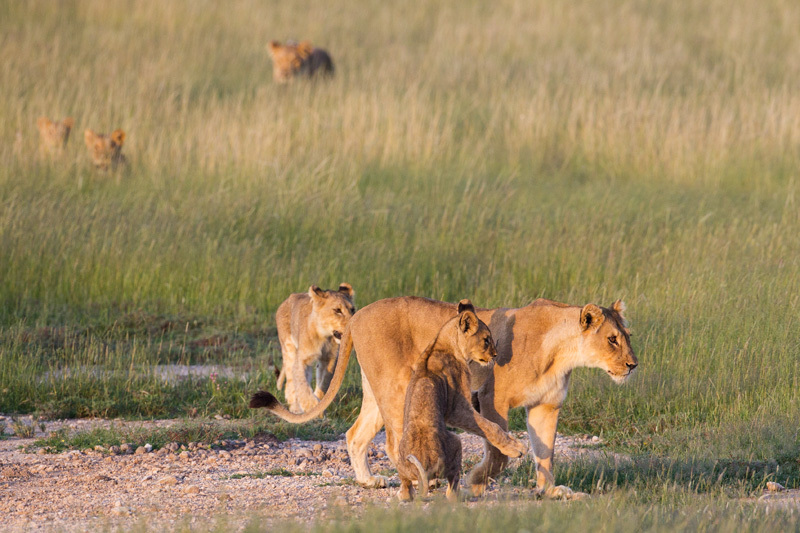 More cubs pop up and walk toward the waterhole as the sun is about to go down for the day. 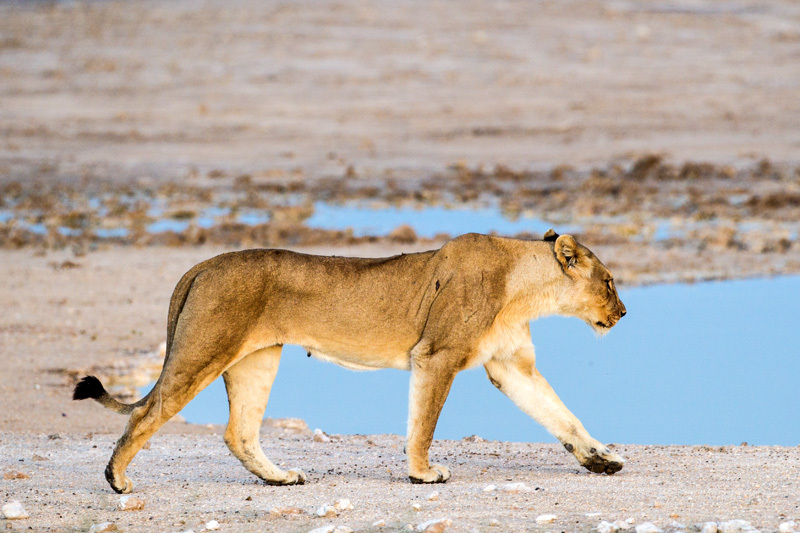 The mother lion walks toward the waterhole.